Get-MailboxDatabaseCopyStatus will check and show status of all mailbox databases in all the DAG’s in Microsoft Exchange environment. Test-ReplicationHealth check all aspects of replication and replay, or to provide status for a specific Mailbox server in a database availability group (DAG). As a result we will get mailbox databases copy status, CopyQueueLength, ReplayQueueLength, LastInspectedLogTime and ContentIndexState. As a result we will receive server name, name of test (Check) and result of test. All results should be Passed. 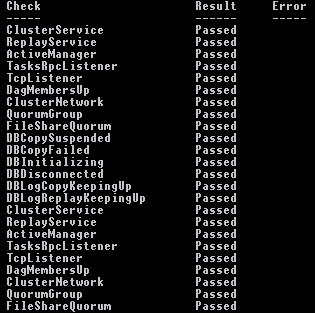 Tagged DAG, Database Availability Groups, Get-MailboxDatabaseCopyStatus, Microsoft Exchange 2010, Test-ReplicationHealth. Bookmark the permalink.